Can long-term customer loyalty to estate agents REALLY be achieved? Can long-term customer loyalty to estate agents REALLY be achieved? Home » Features » Agencies & People » Can long-term customer loyalty to estate agents REALLY be achieved? 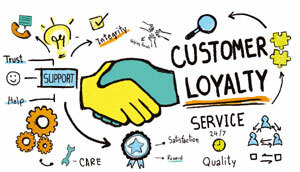 Caring, sharing, talking, doing – today’s successful agencies are focused on customer loyalty, says Joanne Christie, but there’s more to it than asking them for a review. In a trading statement earlier this year, Purplebricks outlined its intention to create ‘lifetime relationships’ with its customers in a bid to keep the brand front and centre in vendors’ minds between one move and the next. In an interview with the Press Association in July, the company’s CEO, Michael Bruce, expanded on the strategy and floated the idea of a branded dashboard that allows customers to see all their household suppliers in one place. Although Purplebrick’s approach to keeping in touch with past vendors is clearly very different to that of traditional agents, the desire to build longlasting relationships is present in all sectors of the property business. The central dilemma faced by agents remains the same whether online or high street: how can one capitalise on good service when they are in a business where people only need their service once in a blue moon? Given that a Zoopla poll last year revealed the average Brit moves home only once every 23 years, it’s hard to see how anyone’s business could survive if the idea was that by simply ensuring your customers were happy they’d come back. Of course, the idea hasn’t always been that if you do a good job customers themselves will return, but rather that they might recommend you to other customers and this remains true today, albeit in today’s increasingly online world, the means to achieving this has changed somewhat. The highest level of communication demonstrates that their custom remains important, ensures loyalty and, maybe, recommendations. James Priestley, Priestleys Estate Agents. Given that we live in a world where almost no one books a holiday without reference to TripAdvisor, reviews have also become an increasingly important tool for agents. According to Ben Marley, Head of Market Development at review platform Feefo, with 4,400 estate agents signed up, reviews offer multiple benefits to agents. We believe in giving customers useful content to help them to extract the most from their property portfolio while also instilling trust. Andrew Matin, Harrisons. The premise behind Short’s company is that rather than rate agents based on customer reviews, it compares Land Registry data against Rightmove, Zoopla and OnTheMarket listings to show potential vendors which agents in their area have sold the most properties, how quickly they typically sell them and what percentage of the asking price they usually achieve. “We feel strongly that the only way to rate estate agents is not subjectively, but objectively,” says Short. While all of these websites are aimed at using previous customers’ experiences to bring in new customers, that’s not to say agents shouldn’t also focus on keeping in touch with their previous customers directly. While the average person may move infrequently, there are vendors who move much more often. 80% of buyers are happy with the agent they bought it from – but it’s a self-selecting definition, as buyers, by definition the property sale was successful. Tom Staff, Hello Again. The easier sources to which Staff refers are previous purchasers. “About 80 per cent of people who buy a house are happy with the agent they bought it from and that is not because agents are particularly good, but it is a self-selecting sample. If they were purchasers by definition the property sale was successful,” he says. While many agents have long kept in touch with previous buyers via mailshots, Christmas cards and the like, Hello Again’s proposition is to send them a bespoke property report on the anniversary of a buyer’s move-in date. It provides an estimate of what the property is now worth, recent transactions in the area and information about regional and national house prices. This approach could be particular canny in the post-GDPR implementation world, where agents need to make sure those on their database opt in to receiving information from them – if you’re providing something useful they are much more likely to do so. Keeping your brand front and centre with past clients undoubtedly remains important, but not only for the reason of being their first port of call when they next look to market – by maintaining a relationship with them after completion you’ve more chance of getting them to review you or recommend you online, which could sway the decision of someone looking to market right now.